Last year I was supplied with a product to test from a company called Greens Hydroponics, The product in question is called Xtreme Mykos and is described as an all-natural, effective root promoter made up of pure Mychorrhizal Inoculum. Once it has been applied to plant roots, this fungus will colonise the root system and carry on living for the life of the plant. The Mychorrizae spread thin fungal filaments called ‘Hyphae’ from the roots through the growing environment. These filaments reach far beyond where the root hairs of the plant can reach and give the plant access to otherwise inaccessible nutrients and water. Another benefit of the product which is mentioned in the documentation is that it protects from diseases and pests. 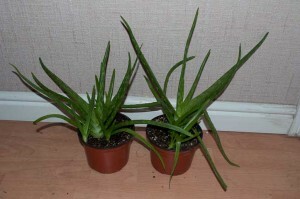 Anyway as I had several Aloe Vera cuttings which I needed to transplant at the time I saw this as a good time to try the product. I found pairs of cuttings which were very similar in size and transplanted one of each pair in new compost and one of each pair in compost whilst also putting in a tablespoon of Mykos which was poured onto the roots as they were placed into the compost. They were transplanted 5 months ago and due to the winter and slow growth it’s only now that I can actually really see any difference, But as you should be able to tell yourself from the pictures below it does indeed work as the packaging and helps the plants overall growth and resistance to problems. 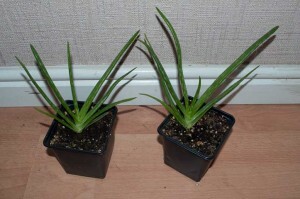 The photo to the right shows the smallest pair of transplants I made, the one with the Mykos added is shown on the right and as you can see the size of the overall plant is definitely larger and stronger. This next photo shows the two largest transplants and again shows a marked improvement in growth, with the right hand with the Mykos root promoter being a lot larger and healthier. 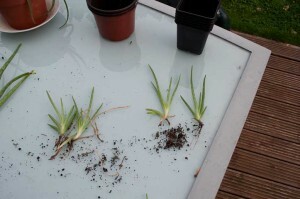 This final photo below shows two of the transplants which I’ve left outside over winter, they have been inside a greenhouse but were still exposed to the elements and insects. 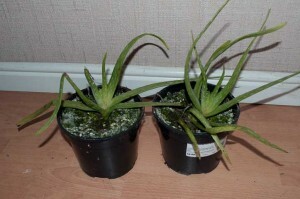 The one on the left which did not have the Mykos root promoter shows a lot of pest and disease problems with most of the Aloe Vera branches being damaged or diseased at the tips. The one with the added Mykos on the right shows a lot less damage, So the additive does appear to have helped quite a bit with the overall resistance available to the plant. 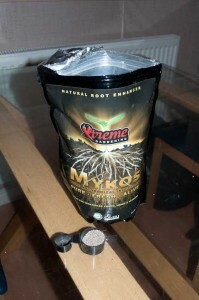 All in all I think I will be using Xtreme Mykos from now on whenever I transplant a plant or seedling to give it a little boost to the plant when it’s much needed. Although it’s quite expensive only a small amount is needed for each plant and the packet will last quite a while before needed to be replaced. The product I tested was supplied to me free of charge from Greens Hydroponics who currently have the product for sale at £19.76. They also have a sale on during February and have a discount of 10% available on everything available online.